As a widespread drought continues on throughout much of the country we are receiving calls from homeowners, engineers and government agencies concerned about water levels in their lakes. Whether it be for recreation, sediment build-up or monitoring sources of drinking water, the importance of having and accurate lake map has never been higher. One agency told us they needed to have an idea as to what the lake surface area is and how the lakes elevation compares to lake volume. They needed to complete a lake survey to make sure adequate water was available, so the pumps don’t run dry. Another common challenge deals with the impacts of sedimentation in lakes. A sediment survey can point out patterns and masses of build-up that can allow for a more focused dredge rather than a full-scale project. Dredging is one of the most costly projects that a community or pond owner will incur during the life of a pond. Proper planning for a dredging project could mean cost savings. The Mapping Network understands the challenges and costs associated with locating and removing sediment. We specialize in accurately mapping bodies of water, calculating the water volume, collecting sediment depth samples at critical areas and monitoring the distribution of sediment over time. Where is the highest sedimentation occurring? How much sediment (in cubic yards) is in each cove? If the lake is drawn down 5 ft, what would the shoreline look like? How much water (gallons and acre-ft) is in the lake? If we make each cove a minimum of 4 feet deep for boat access how much material do we need to remove? By undertaking this mapping process will it save us money in the end? Each of these questions can be answered by mapping the lake using The Mapping Network’s system. We are able to locate the problems areas and calculate the volume (in cubic yards) of material to be removed. The lake mapping data allows us to show the new shoreline if a lake is drawn down 1 ft, 5 ft, 10 ft, etc. Also, calculating water volume at various lake levels can be done. One of the best aspects of the mapping process is it allows the owner and contractor to be on the same page. Successful planning and execution of the dredging project can ensue. We have seen clients save tremendous amounts of money by using The Mapping Network to survey their lake before undertaking the dredging process. Below are a set of maps for a drinking water reservoir. Originally built in the 1930’s, this lake has filled in substantially over time. Now less than half the original lake capacity remains. With a sustained drought there is a fear the lake will not be able to produce enough water for the city. Engineers and the local government used The Mapping Network to survey the current lake depths along with charting the original lake bottom. 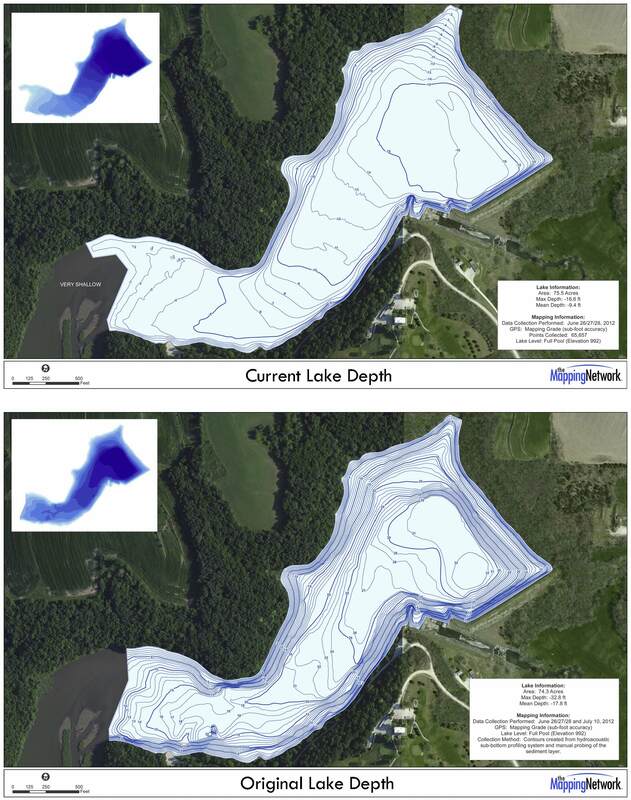 The final maps revealed a substantial sediment problem throughout the entire lake. Plans are underway to remove sediment and regain much of the carrying capacity of the lake. The top map shows the current lake depths. The bottom map was produced using a hydroacoustic sub-bottom profiling system along with manual sediment probes. Engineers and lake management professional around the country have benefited from this specialized technology offered by The Mapping Network. 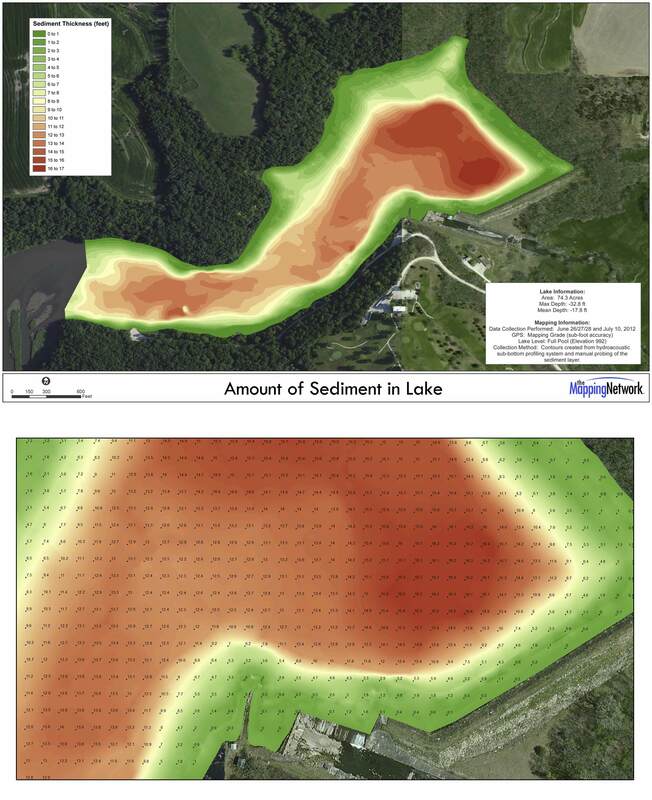 Map showing the amount of sediment throughout the lake (top image). The capacity of this lake has been greatly reduced due to over 70 years of sedimentation. The bottom image shows a grid pattern with the amount of sediment measured in feet. Engineers will use this data to create a dredging plan. This entry was posted in Lake Map, News, Sediment and tagged 2012 drought drinking water, Bathymetric Map, Bathymetry, Dredge, Dredging, drinking water shortage, drought imapct on lake, drought lake map, Fishing, GIS, GPS, GPS Lake, GPS Lake Map, GPS Map, Habitat, hydrographic survey, Hydrographic Surveying, hydrography, lake dredge, Lake Management, Lake Map, Lake Mapping, Lake Survey, low water levels, Sediment, Sedimentation, Survey, The Mapping Network on February 21, 2013 by Moderator. As the drought of 2012 continues on throughout much of the country we are receiving calls from homeowners, engineers and government agencies concerned about water levels in their lakes. Whether it be for recreation, sediment build-up or monitoring sources of drinking water, the importance of having and accurate lake map has never been higher. One agency told us they needed to have an idea as to what the lake surface area is and how the lakes elevation compares to lake volume. They needed to complete a lake survey to make sure adequate water was available, so the pumps don’t run dry. Another common challenge deals with the impacts of sedimentation in lakes. A sediment survey can point out patterns and masses of build-up that can allow for a more focused dredge rather than a full-scale project. This entry was posted in Lake Map, News, Sediment and tagged 2012 drought drinking water, Bathymetric Map, Bathymetry, Dredge, Dredging, drinking water shortage, drought imapct on lake, drought lake map, Fishing, GIS, GPS, GPS Lake, GPS Lake Map, GPS Map, Habitat, hydrographic survey, Hydrographic Surveying, hydrography, lake dredge, Lake Management, Lake Map, Lake Mapping, Lake Survey, low water levels, Sediment, Sedimentation, Survey, The Mapping Network on December 26, 2012 by Moderator. This entry was posted in Lake Map, News, Sediment and tagged 2012 drought drinking water, Bathymetric Map, Bathymetry, Dredge, Dredging, drinking water shortage, drought imapct on lake, drought lake map, Fishing, GIS, GPS, GPS Lake, GPS Lake Map, GPS Map, Habitat, hydrographic survey, Hydrographic Surveying, hydrography, lake dredge, Lake Management, Lake Map, Lake Mapping, Lake Survey, low water levels, Sediment, Sedimentation, Survey, The Mapping Network on October 5, 2012 by Moderator. This entry was posted in Lake Map, News, Sediment and tagged 2012 drought drinking water, Bathymetric Map, Bathymetry, Dredge, Dredging, drinking water shortage, drought imapct on lake, drought lake map, Fishing, GIS, GPS, GPS Lake, GPS Lake Map, GPS Map, Habitat, hydrographic survey, Hydrographic Surveying, hydrography, lake dredge, Lake Management, Lake Map, Lake Mapping, Lake Survey, low water levels, Sediment, Sedimentation, Survey, The Mapping Network on September 5, 2012 by Moderator.